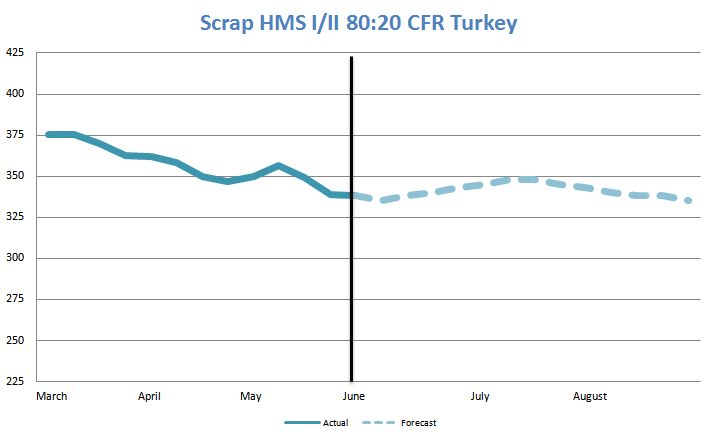 All charts included in the Orbis Turkish Scrap Forecaster are for HMS I/II 80:20 CFR Turkey prices, while prices and charts for other scrap grades and regions can be found on our website. Having started the month of March with strong demand for scrap, Turkish steel producers reduced their scrap booking activity during the rest of the month amid the increased caution in the global market resulting from the US decision to impose 25 percent duty on imported steel and from ongoing trade investigations. 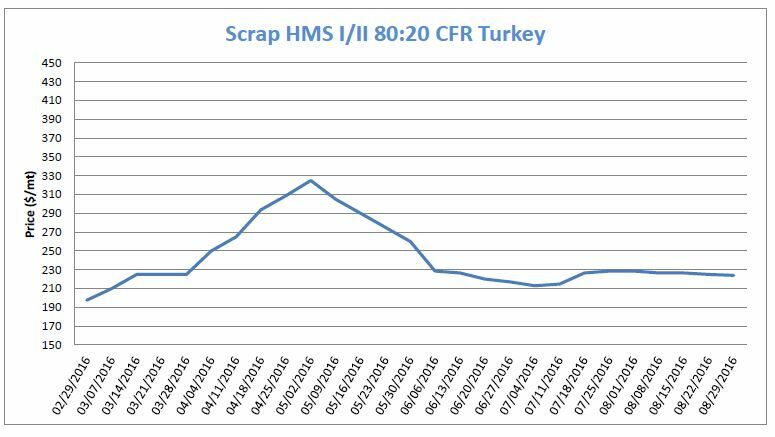 Although scrap suppliers sought to resist the downward pressure on their quotations, Turkish mills increased their pressure on import scrap prices, which started to decrease beginning from the second week of March. Despite the declines seen in import scrap prices beginning from the second week of March, domestic rebar prices in Turkey mostly moved upwards on Turkish lira basis during the month due to the depreciation of the Turkish lira against the US dollar. However, since the US government decided to impose 25 percent duty on imported steel and given the repercussions following the decision by the European Commission (EC) to start a safeguard duty investigation into steel imports, rebar demand in Turkey and in the global market almost came to a halt, causing domestic rebar prices in Turkey to soften in the last week of March. Demand for Turkish rebar in the export markets, which was already weak, almost came to a standstill in March since the US started to impose duty on imported steel and as the EC initiated a safeguard duty investigation. Accordingly, Turkish rebar export prices moved downwards throughout the month in question. Already faced with weak demand in the domestic and export markets, in April Turkish mills' demand for import scrap slowed down as they started to be more cautious about making new scrap bookings since their production costs increased amid higher prices for electricity and natural gas. 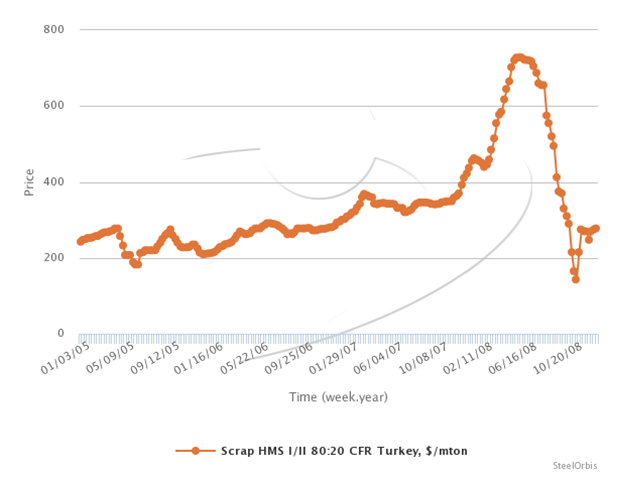 Against the backdrop of weak demand, import scrap prices in Turkey decreased until Turkish mills stepped up their demand for scrap in late April. Although Turkish mills were heard to conclude occasional rebar sales to Canada, North Africa, Yemen and Israel in April, demand for Turkish rebar was generally weak in the export markets during the given month. Meanwhile, Turkish mills also failed to achieve their targets in terms of sales volumes and prices in their domestic market in April. However, despite the weak demand and the declines in import scrap quotations, prices in the local Turkish rebar market recorded some increases due to the depreciation of the Turkish lira against the US dollar, with domestic rebar prices characterized by a fluctuating trend in April. Even though domestic rebar demand in Turkey recovered slightly in the last week of April as buyers started to replenish stocks, it remained slack overall during the month. Having begun the month of May with an upward movement, global scrap prices decreased amid weak demand beginning as of the second half of the month and continued their downward movement throughout the month. 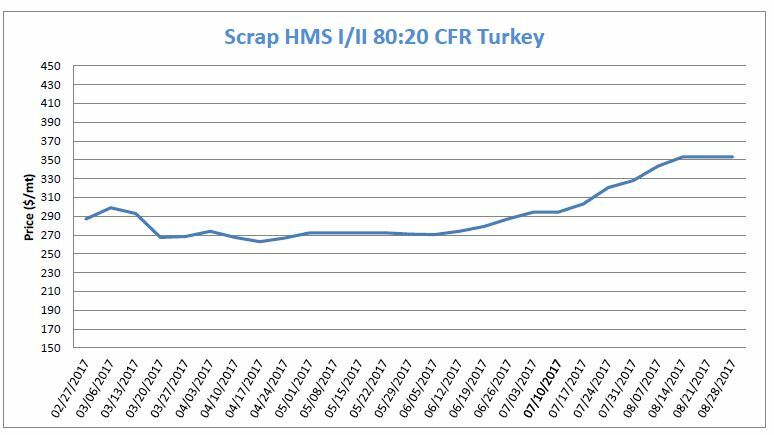 In the Orbis Turkish Scrap Forecaster for May 2018, we had predicted that import scrap prices in Turkey would start the month of May with a recovery, supported by decent domestic scrap demand in Europe and the US - the main sources of scrap for Turkish steel producers. 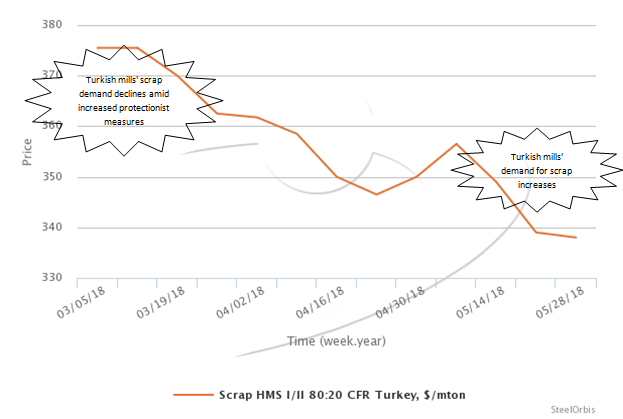 However, considering that Turkish mills would slow down their scrap bookings and would exert further pressure on import scrap prices since no recovery was expected in terms of their domestic and export steel sales, we had predicted that global scrap suppliers would have to reduce their offer prices as Turkey - the world's leading importer of scrap - decreased its scrap demand and that global scrap prices would decrease beginning from the second half of the month. Import scrap prices in Turkey trended completely in line with our prediction in May, though the price movements were a little sharper than our expectation mostly because of the sudden changes in exchange rates, which is one of the scenarios excluded in our forecasts. As a result, import scrap prices were slightly below our expectation at the end of May, with the deviation between our forecast price and the actual price of import scrap standing at 1.1 percent at the end of the month. In late March, the US government had announced that Canada, Mexico, Argentina, Australia and EU countries were temporarily exempted from the 25 percent Section 232 steel import duty and that this exemption may be extended or may end depending on bilateral negotiations with the countries in question. In early May, the US extended the exemption deadline for one month, stating that it will finalize the regulations regarding the exemptions by June 1, Meanwhile, South Korea was directed to decrease its steel exports to the US by 30 percent of the average export volume for the past three years, in exchange for an indefinite exemption from the Section 232 steel tariffs. A similar agreement regarding quotas was made with Argentina. However, on May 31, the US government announced its final decision in relation to Section 232 exemptions and stated that a 25 percent tariff on steel imports from the EU, Canada and Mexico would come into effect as of June 1. Following the declines in global scrap prices in April, prices in the local US scrap market were mostly revised downwards for the May buy-cycle as compared to April, especially for cut grades. 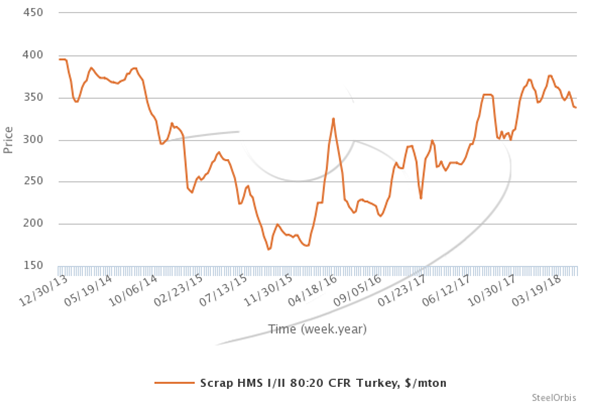 Prices of busheling scrap, which is the scrap grade most in demand in the US, mainly moved sideways, while prices of shredded, P&S and HMS scrap decreased by $10-30/mt, depending on the region. Having made several import scrap bookings in late April, Turkish steel producers reduced their demand for scrap in early May. For the entire month, Turkish mills were in no rush to make new scrap bookings and concluded deals only to meet their immediate needs, against the backdrop of factors including the uncertainty in the market ahead of the snap election to be held on June 24, the lack of any final decision regarding ongoing trade investigations, and also since steel demand in the Turkish domestic market was almost at a standstill due to the sharp depreciation of the Turkish lira against the US dollar. Experiencing difficulties in terms of concluding sales, Turkish steel mills exerted additional pressure on import scrap prices in May in order to reduce their steel production costs. As scrap suppliers, especially those who were under pressure to conclude export deals, had to accept Turkish mills’ firm bids, import scrap prices for Turkey moved downwards throughout the month. 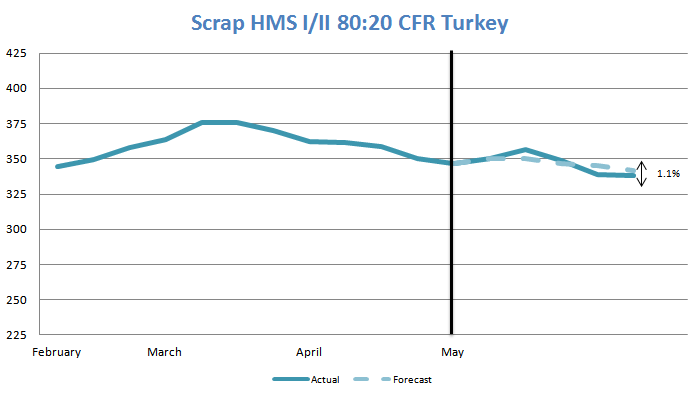 While demand in the local European scrap market remained strong in May, suppliers of ex-Europe scrap found it difficult to meet Turkish mills’ price expectations which decreased each day. However, the number of European scrap suppliers who were willing to conclude sales to Turkey increased in late May due to the significant weakening of the euro against the US dollar. 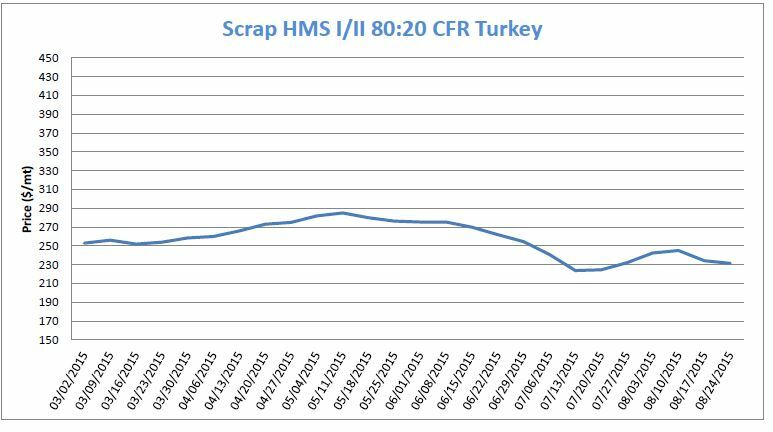 Turkish steel mills, who slowed down their deep sea scrap bookings in May, consistently preferred to meet their import scrap needs via bookings of short sea scrap due to its advantage in terms of price and lead times. Entering the month of May, rebar and iron ore inventories started to decline slightly in China and steel demand strengthened, causing domestic steel mills to accelerate their production and so global iron ore prices moved up. In early May, the opening of iron ore futures trading at Dalian Commodity Exchange to foreign investors at first positively affected iron ore prices. However, during the rest of the month, declining house sales in China and an expected slowdown in the construction industry signaled a decline in steel demand, resulting in a slight reduction in iron ore prices. Against this backdrop, global iron ore prices decreased by a total of 0.8 percent in May, amid fluctuations. Having started the month of May amid positive expectations, ex-Australia coking coal prices partially recovered the losses they had recorded in previous weeks. In this context, the price gap between normal grade hard coking coal and premium hard coking coal widened again, as the prices of premium material increased by a larger margin. Meanwhile, Chinese steel mills accelerated their raw material bookings as domestic steel demand in the country increased and this situation also provided support for the upward movement of Australian coking coal prices. However, since environmental policies restricted the increase of coking coal consumption in China, the increase in demand for Australian coking coal in China and the rises in prices remained limited. In late May, buyers reduced their firm bids for ex-Australia coking coal, while suppliers were unwilling to decrease their quotations, which resulted in slower booking activity, in prices switching to a sideways trend and in a wait-and-see stance prevailing among buyers. In May, spot prices of graphite electrodes moved upwards again as supply remained tight. Since steel producers in some countries, including Iran and Malaysia, offered higher prices for graphite electrodes, Turkish mills were also faced with higher price offers from electrode suppliers in the spot market. Accordingly, prices of electrodes for electric arc furnaces increased to $25,000-27,000/mt. As demand in the local Chinese billet market was at decent levels in early May and given the rises seen in iron ore prices, Chinese billet offers to the export markets moved upwards in the first week of May. However, during the rest of the month, rainy weather in China and the declines in iron ore prices resulted in a slight slowdown in domestic billet demand in the country. Due to the weakening of domestic billet demand and high capacity utilization rates of steel mills, billet stocks in the Chinese market increased, which resulted in downticks in Chinese billet export offer prices. However, Chinese billet offers to the export markets generally moved on a fluctuating trend during May and did not record any sharp declines. In the first three weeks of May, buyers in CIS-based billet suppliers’ traditional export markets accelerated their bookings as a result of their reduced inventories and ex-CIS billet offers increased accordingly. However, billet sales from the CIS to the export markets, especially to the Middle East and North Africa, slowed down during the remainder of the month as buyers withdrew from the market after meeting their needs. Meanwhile, in Turkey, long steel producers continued to book billet from the CIS region only in line with their immediate needs as both their domestic and export sales were stagnant. As a result, the three week-long upward movement of ex-CIS billet quotations, which had been supported by demand, came to an end and gave way to a softening trend. Demand in the local Turkish rebar market, which has been slack for a long time due to the uncertainty in the market resulting from the high volatility of the Turkish lira-US dollar exchange rate, almost came to a halt in the fourth week of May (May 21-25) as the Turkish lira weakened to a record level against the US dollar. In this context, domestic rebar prices in Turkey exceeded the psychological threshold of TRY 3,000/mt ex-warehouse, reaching a new historical high of TRY 3,200/mt ex-warehouse in the Marmara region on May 23. Meanwhile, demand for domestic rebar in Turkey remained generally slack in May and buyers concluded deals only to meet their immediate needs, while the snap election to be held on June 24 and Ramadan also negatively impacted trading activity in the market. In May, US-based steel producers failed to increase their prices to target levels, since buyers bought steel imports from countries which were able to offer more favorable prices as compared to price levels in the domestic market benefitting from exemptions from the 25 percent Section 232 import duty. As a result, prices in the local US rebar market, which had increased gradually in previous months, moved sideways in May. Despite the 25 percent Section 232 import duty and the ongoing antidumping duty, ex-Turkey rebar offer prices to the US were still lower than domestic rebar prices in this destination. However, since rebar offers to the US from other countries temporarily exempted from the 25 percent import duty were more attractive than Turkish rebar quotations, US-based buyers preferred to meet their needs from these countries instead of from Turkey. Accordingly, in May, US-based buyers continued to make price inquiries for Turkish rebar, though no deals were heard. In the third week of May, Canada announced the conclusion of its reinvestigation to update the normal values respecting rebar originating in or imported from Turkey and other countries. For Turkish producers who submitted a complete response to the requests for information, specific normal values have been determined, while for other Turkish exporters normal values will be determined by ministerial specification, which are calculated by advancing the export price of the goods by 41 percent. Although it was heard that a Turkish mill concluded a deal to Canada for 30,000 mt of rebar at $560/mt FOB before the announcement in question, demand for Turkish rebar in Canada was generally weak in May. In the second week of May, Egypt’s Ministry of Industry and Trade announced that the termination of the countervailing duty investigation on rebar imports from Turkey and China, without the imposition of any sanctions. However, due to the current antidumping duties on Turkish rebar in Egypt, Turkish rebar offers to the Egyptian market failed to attract buyers when compared to domestic rebar prices in Egypt. As a result, no Turkish rebar deals were concluded in Egypt in May, just as in previous months. Rebar sales for delivery by truck concluded by Turkish steel mills, particularly those in Turkey’s Iskenderun region, to markets such as Syria and Iraq remained limited in May due to conflict and political tensions in the region. Meanwhile, in the first half of the month, Turkish mills made regular rebar sales to Israel and Yemen, while concluding deals to Ethiopia and Colombia for small rebar tonnages. However, in general, sales of small tonnages of Turkish rebar to other export markets were slack in May, just like in previous months. In May, Far Eastern buyers stepped up their price inquiries for Turkish rebar as there was no significant gap between rebar offer prices from Turkey and those from China to the region. However, since Chinese suppliers preserved their lead time advantage, Far Eastern buyers continued to prefer to meet their billet and rebar needs from China instead of from Turkey. In May, just as in previous months, Turkish mills did not conclude any rebar sales to the United Arab Emirates (UAE), where once they used to sell large tonnages of rebar. While domestic producers in the local UAE rebar market reduced their prices at the start of May, demand and trading activity in the market slowed down as of mid-May as Ramadan began. However, due to the widespread rumors that other GCC countries were also planning to increase rebar import duty from five percent to 10 percent following the example of Kuwait, UAE-based producers increased their prices for their domestic market. The snap election to be held in Turkey on June 24, the start of Ramadan as of mid-May and the sharp depreciation of the Turkish lira against the US dollar resulted in uncertainty in the Turkish wire rod market. Accordingly, demand in the local Turkish wire rod market was weak in May, while Turkish mills kept their prices unchanged. As for the export markets, Turkish mills continued to conclude sales to their traditional markets such as North Africa and Israel, though demand for Turkish wire rod in export markets was generally slack. As a result, Turkish wire rod exporters revised their quotations downwards in the fourth week of May. Considering the ongoing volatility of the Turkish lira-US dollar currency rate, the Ramadan period which will continue until the second half of June and the snap election in Turkey to be held on June 24, the uncertainty in the local Turkish rebar market which prevailed during May is expected to continue in June. As a result, domestic rebar demand in Turkey is not expected to recover and prices will likely depend on the fluctuations in the Turkish lira-US dollar currency rate in the coming period. Steel producers in the US, which had failed to increase their domestic prices in May due to buyers’ interest in import bookings, are expected to increase their prices at first in June, as the outcome of the Section 232 investigation is in their favor. However, when US-based buyers start importing steel from countries which still have a price advantage despite the current import duty, producers are expected to limit the upward revision of their prices. Since the US has started to impose 25 percent duty on steel imports excluding imports from Argentina, Australia, Brazil and South Korea, rebar supplies in the US are expected to decrease. Meanwhile, despite the import duty in question, ex-Turkey rebar offers to the US are still lower than US domestic rebar prices. This situation is expected to continue to prevail and Turkish mills are expected to conclude rebar deals to the US as demand for Turkish rebar in the country increases. Turkish mills’ rebar offers to Egypt are not competitive as compared to Egyptian producers’ domestic rebar prices due to the current antidumping duties against imported rebar from Turkey. Accordingly, demand for Turkish rebar in Egypt, where Turkish mills used to conclude sales of large rebar tonnages in previous years, is expected to remain weak in June, just like in previous months. Due to the pricing policy in the UAE domestic market, according to which UAE-based producers revise their prices depending on Turkish mills’ price offers in order to prevent imports, demand for Turkish rebar was already weak in the UAE. With the widespread rumours that other GCC countries are planning to increase rebar import duty from five percent to 10 percent, Turkish mills’ rebar exports to the UAE are expected to be blocked entirely. The investigation initiated by Canada to revise the minimum import duty set for Turkish producers ended without the imposition of any measures that would block Turkish mills’ rebar exports to Canada. However, since the temporary exemption of Canada from the 25 percent import duty in the US has ended having lasted two months, rebar supplies in Canada are now expected to be in equilibrium with Canadian domestic rebar consumption. As a result, demand for Turkish rebar in Canada will likely decrease. As June begins, although ex-Turkey rebar offers to the Far East - the leading rebar export market for Chinese suppliers - have decreased to levels below Chinese suppliers’ quotations, the difference between the prices is still insufficient to attract Far Eastern buyers. As a result, Far Eastern buyers will likely meet their rebar needs mostly from China considering shipment dates and freight rates, though they are also expected to continue to make inquiries for Turkish rebar. In the short term, Chinese suppliers will likely maintain their price advantage as domestic steel demand in China is expected to slow down due to the upcoming rainy season. While demand for Turkish rebar in export markets such as Syria and Iraq which are plagued by conflict and political tensions is not expected to recover during Ramadan, Turkish mills are expected to continue to conclude rebar sales at an unchanged pace to the other markets to which they usually conclude deals for small tonnages. Since billet inventories in China are on the high side and as domestic billet demand in the country is expected to decrease due to the upcoming rainy season, Chinese billet offers to the export markets will likely soften in line with lower prices and demand in domestic market in the coming period. Due to the Ramadan period which will continue until mid-June, billet buyers in Turkey and Egypt, the most important export markets for CIS-based billet suppliers, are expected to be in no rush to make new bookings. Meanwhile, the ongoing weakness of demand for Turkish long steel in target markets which has been observed for a while now has resulted in slack demand for billet imports in Turkey. Accordingly, also given the snap election in Turkey to be held on June 24, Turkish demand for ex-CIS billet is expected to remain weak in the short term. At the start of June, flows to scrap yards in the US are at decent levels amid improved weather conditions, while, with prices in scrap export markets having decreased, scrap inventories in the US - especially on the East coast - are at high levels as a result of reduced scrap exports in May. In the meantime, the US continues to import scrap. Amid such market conditions, prices in the local US scrap market are expected to face downward pressure in June, particularly for cut grade scrap. However, busheling scrap prices in the country are expected to move sideways amid decent demand and also since producers of hot briquetted iron (HBI) and direct reduced iron (DRI), which are used as alternatives for busheling scrap, will start maintenance works in June. The European market, currently characterized by strong steel demand and increased capacity utilization rates of steel mills, will enter the summer holiday period in August. Steel production in Europe is not expected to decline before the holidays and accordingly scrap demand in the region will likely remain strong until then. As June begins, the depreciation of the euro against the US dollar resulting from the political crisis in Italy has started to ensure a price advantage for European scrap exporters. In order to benefit from this situation, Turkish steel mills will likely direct their scrap bookings to European suppliers and so ex-Europe scrap bookings in Turkey are expected to increase if European suppliers meet Turkish mills’ price expectations with the support of the weaker euro. While their import scrap bookings were quite limited in May, Turkish steel mills are expected to step up their scrap bookings in June in order to meet their inventory requirements. While global scrap prices have entered the month of June with on a downward trend, Turkish steel mills are expected to respond to demand from buyers in the global market and to conclude deals, and also to conclude sales to the US as the Section 232 investigation has ended. 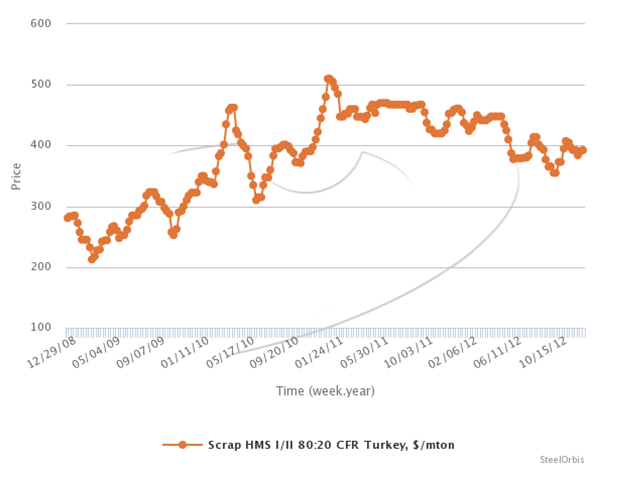 As a result, as Turkish mills’ demand for scrap increases, the downward movement of global scrap prices is expected to end. However, no significant declines are foreseen in global scrap prices since no supply problems are observed. As the month of June begins, Chinese domestic finished steel demand has weakened and iron ore inventories at Chinese ports have continued to rise. In addition to the high levels of inventories at the ports, Chinese mills are expected to carry out maintenance works during the summer months and so demand for iron ore will likely decrease. Coking coal supply is expected to see some bottlenecks in Australia due to railway maintenance works which will last the whole summer. Accordingly, buyers with contracts will have priority, while coking coal supplies to the spot market will be carried out later. If supply shortages intensify, Australian coking coal prices in the spot market may increase. At the start of June, the problem of tight supply in the global graphite electrode market still remains unresolved. There has not been any significant improvement in relation to the issue, while market sources state that Turkish mills are frequently getting in contact with electrode producers and conducting market research in order to avoid any supply problems in the coming period. In the short term, global electrode supply is expected to tighten further and prices will likely remain at high levels. After Donald Trump announced today that it would lift the temporary exclusion on Section 232 tariffs on steel and aluminum imports from Canada, Mexico, and the European Union, those countries vowed to retaliate against products they import from the US. European officials have reportedly threatened to retaliate against US-produced orange juice, peanut butter, kitchenware, clothing and footwear, washing machines, textiles, whiskey, motorcycles, boats and batteries. Meanwhile, NAFTA partners were also reportedly surprised by the announcement given the ongoing status of renegotiating the trade agreement. "Canada considers it frankly absurd that we would in any way be considered to be a national security threat to the United States," Canadian Foreign Minister Chrystia Freeland said. "The government is absolutely prepared to and will defend Canadian industries and Canadian jobs. We will respond appropriately." Mexico responded to the news by announcing retaliatory tariffs on products including pork belly, apples, grapes, blueberries and flat steel. "Mexico deeply regrets and rejects the decision of the United States to impose these tariffs on imports of steel and aluminum," Mexico’s economy ministry said in a statement, adding that Mexico's retaliatory measures "will be in force until the US government eliminates the imposed taxes." US Department of Commerce Secretary Wilbur Ross told news media that in terms of the NAFTA talks, the tariffs could hinder the negotiations among the North American neighbors. Ross said there was "no longer a very precise date when they may be concluded and therefore (Canada and Mexico) were added into the list of those who will bear tariffs." The European Commission has reacted to the 25 percent duty imposed by the US on steel imports from the EU. EU Commissioner for Trade Cecilia Malmström commented on the decision as well, stating, "Today is a bad day for world trade. We did everything to avoid this outcome. Over the last couple of months I have spoken at numerous occasions with the US Secretary of Commerce. I have argued for the EU and the US to engage in a positive transatlantic trade agenda, and for the EU to be fully, permanently and unconditionally exempted from these tariffs. This is also what EU leaders have asked for. Throughout these talks, the US has sought to use the threat of trade restrictions as leverage to obtain concessions from the EU. This is not the way we do business, and certainly not between longstanding partners, friends and allies. Now that we have clarity, the EU's response will be proportionate and in accordance with WTO rules. We will now trigger a dispute settlement case at the WTO, since these US measures clearly go against agreed international rules. We will also impose rebalancing measures and take any necessary steps to protect the EU market from trade diversion caused by these US restrictions." The municipal government of Tangshan in China’s Hebei Province has issued emergency emissions reduction measures effective from May 26 to May 31 inclusive, aimed at tackling air pollution. Tangshan Meteorological Bureau had predicted worsening meteorological conditions in Tangshan for the period in question, due to reduced dispersion of atmospheric pollutants. The emergency emissions reduction measures include halting of production at sintering machines and shaft furnaces in the Lubei, Kaiping, Guye, Fengrun and Fengnan districts and in Luan county, while 50 percent capacity cuts for sintering machines and shaft furnaces in other districts of Tangshan city. Meanwhile, transport vehicles are not allowed to enter or leave factory areas in steel, coking, electric power, chemical, cement and coal mining industries during the period in question. Furthermore, mining facilities and ore crushing plants will halt production completely during the given period. As reported by SteelOrbis on April 11, the Chinese graphite electrode market may face oversupply by 2020, but given the commissioning of new EAFs in China, Chinese graphite electrode consumption is expected to increase over the next two years, therefore continuing to support high prices globally in 2018 and 2019. In 2017, China produced between 520,000-590,000 mt (depending on reporting source) of graphite electrodes, out of which around 202,000 mt was exported (34-39 percent) and the rest was utilized for domestic consumption. However, the ratio of domestic consumption versus exports of graphite electrodes is forecast to increase in 2018 with higher scrap usage by EAFs, thereby increasing domestic consumption to 500,000-530,000 mt in 2018. With a total estimated production of 600,000-610,000 mt of graphite electrodes in 2018, only 12 to 18 percent is expected to reach the export market. In 2019, 12-15 percent of the 650,000 mt production is expected to reach the export market. By 2020, some expect domestic production of 720,000 mt to process the potential 150 million mt of scrap used by Chinese EAF’s with only 12-15 percent of the graphite production reaching the export market. The World Trade Organization (WTO) has announced that Turkey has notified the WTO’s Council for Trade in Goods of its intention to take counter-measures against the US tariffs on steel and aluminum imports. Accordingly, effective from June 21, Turkey may apply additional customs duties ranging between five percent and 40 percent on 22 products imported from the US, including nuts, rice, unmanufactured tobacco, coal, coke, structures and parts of structures of iron or steel, paper and machines and mechanical appliances. In its notification to the WTO, Turkey stated that it is facing additional US tariffs worth $266.55 million on steel and aluminum products. Meanwhile, Russia and Japan have also notified the WTO’s Council for Trade in Goods of their intention to impose retaliatory tariffs on certain imports from the US. Russia stated that the US tariffs on steel and aluminum imports would add duties of $537.6 million to its annual steel and aluminum exports, while Japan said that the application by the US of the increased duty of 25 percent on steel imports and 10 percent on aluminum imports from Japan would result in a total of $439.9 million of duty collection by the US. In an interview with Turkish online daily Bloomberg HT, Turkish steelmaker Tosyalı Holding chairman Fuat Tosyalı said that, following the 25 percent import tariff the US imposed on steel imports under Section 232, the Turkish market is threatened by steel imports from Ukraine and Russia. “If imports are a threat for the US, they are a much bigger threat for Turkey and the Turkish steel industry must be protected,” he added. “We import 15-16 million mt of scrap from the US and sell back quality products to the country. We buy more than we sell but still we are considered in the same category as the countries with trade imbalances. This is very unfair and I believe the decision is political but I hope it will be corrected. The cost of these import tariffs will be paid by Americans, as they will buy more expensive steel,” Mr. Tosyalı said. Recalling that Turkey's import duty on rebar has ben removed, Fuat Tosyalı said the necessary measures should be taken to protect the Turkish steel industry. The US Department of Commerce (US DOC) has announced that, with respect to its final determinations in the antidumping (AD) duty investigations of imports of carbon and alloy steel wire rod from Italy, South Korea, Spain, Turkey and the UK and countervailing duty (CVD) investigations of the same imports from Italy and Turkey, to correct ministerial errors, it has amended the final antidumping duty rates for Turkey and Spain and the countervailing duty rates for Turkey. Accordingly, the DOC has stated that it has amended the final antidumping determination for Turkey to reflect the correction of this ministerial error in the calculation of the final dumping margin assigned to Habas Sinai ve Tibbi Gazlar Istihsal Endustrisi A.S. (Habas), which changes from 4.74 percent to 4.93 percent. In addition, because the “all-others” rate for Turkey is based on the margins for Habas and the other mandatory respondent, Icdas Celik Enerji Tersane ve Ulasim Sanayi A.S. (Icdas), it has revised the “all-others” rate from 6.34 percent to 6.44 percent. With respect to the final antidumping determination for Spain, the DOC has revised the final dumping margin of CELSA to 10.11 percent from 11.08 percent, while it has also changed the “all-others” rate for Spain from 11.08 percent to 10.11 percent. Meanwhile, the final subsidy rate for Turkey-based Habas has been revised to 3.88 percent from 3.86 percent, while the final subsidy rate for “all-others” in Turkey has been revised from 3.84 percent to 3.85 percent. The DOC will also instruct the US Customs and Border Protection (CBP) to require cash deposits equal to the amounts of 1.05 percent, 4.15 percent and 2.59 percent for Habas, Icdas and all others in Turkey, respectively. The European Commission has announced that it will impose additional customs duties on certain products from the United Stated (US) if the US does not extend EU’s exemptions from Section 232 tariffs on steel and aluminum imports beyond June 1. Accordingly, the commission has stated that, at the first stage, additional duty of a maximum rate of 25 percent may be applied on certain products, including carbon and alloy flat and long steel products and steel pipes from the US, effective from June 20. At the second stage, further additional duty of a maximum rate of 10 percent, 25 percent, 35 percent or 50 percent may be applied on certain US products, effective from March 23, 2021 or upon the adoption by the World Trade Organization (WTO) Dispute Settlement Body of a ruling that the US safeguard measures are inconsistent with the relevant provisions of the WTO Agreement, if that is earlier, until the US safeguard measures cease to apply. SteelOrbis has heard that Gulf Cooperation Council (GCC) countries have reportedly increased the duty on rebar imports from five percent to 10 percent to prevent steel imports deflected from the US because of the Section 232 tariffs. In March this year, Kuwait increased the duty from five percent to 10 percent on rebar imports from non-GCC countries until end of February 2019, as previously reported by SteelOrbis. Ukraine’s parliament has approved the bill to increase the export duty on scrap from €30/mt to €42/mt for a period of one year. The proposed bill had been aiming to impose the increase in export duty on scrap until September 2021. The draft law was submitted to the parliament in April. Yu Yong, president of the China Iron and Steel Association (CISA) and chairman of the state-owned Hebei Iron and Steel Group, stated at the 10th China International Steel Congress held in Beijing that China will shut down more outdated steel mills, aiming to reduce its total crude steel capacity to less than 1.0 billion mt by 2025, and also aiming to keep its overall capacity utilization rate at around 80 percent by that time. China plans to eliminate 30 million mt of capacity this year, while it has already shut down around 100 million mt of illegal low-grade steel capacity which was used to supply the construction industry. Mr. Yu also said that China’s overall steel demand will fluctuate in a downward direction, while adding that overcapacity is going to persist for a relatively long period. “On the basis of China’s achievements in cutting capacity, China will use methods, including the law, market forces, financial instruments and also mergers and acquisitions to continue easing overcapacity,” Yu added. Turkey has decided to take retaliatory measures against the Section 232 tariffs imposed by the US, according to a report by Anadolu Agency. Accordingly, Turkey will impose customs duties on coal, paper, walnut-almond, tobacco, rice, whisky, automobile, cosmetics, machinery and equipment and petrochemical products from the US, worth $1.8 billion. Turkish Minister of Economy Nihat Zeybekci has said in a statement to Anadolu Agency that Turkey’s steel exports to the US amount to around $1.18 billion, while steel imports from the US total more than $1.3 billion, adding that they have already stated to US representatives that Turkey should be exempted from the Section 232 tariffs. Zeybekci also added that from now on Turkey will take necessary steps against the US, though they will be open to any negotiations. US Secretary of Commerce Wilbur Ross has said that the exemption from Section 232 duties might be extended for another month for Canadian imports, if NAFTA talks go well, according to media reports. “Depending where we are with NAFTA on June 1, the president will decide whether or not to extend their situation. So it’s un-forecastable at the moment”, Ross said. On May 1, temporary exemptions from Section 232 duties were extended until June 1 for some countries including NAFTA partners Canada and Mexico. The Canada Border Services Agency (CBSA) has announced that it has concluded a reinvestigation to update the normal values and export prices respecting rebar originating in or exported from China, South Korea, Turkey, Belarus, Taiwan, the Hong Kong Special Administrative Region of China, Japan, Portugal and Spain, and the amounts of subsidy of certain rebar originating in or exported from China. Accordingly, the CBSA stated that specific normal values for future shipments of certain rebar have been determined for all exporters, including Turkey-based Colakoglu Metalurji A.S., İçdas Çelik Enerji Tersane ve Ulasim A.S., Kaptan Demir Celik Endustrisi ve Ticaret A.S. ve Kroman Çelik Sanayii A.S., that submitted a complete response to the requests for information effective May 4. For all other exporters of subject goods originating in or exported from China, South Korea and Turkey (including Habas and Diler Holding), normal values will be determined by ministerial specification, which are calculated by advancing the export price of the goods by 41 percent. Meanwhile, specific normal values for future shipments of certain rebar have been determined for Belarus-based OJSC Byelorussian Steel Works (BMZ), Taiwan-based Tung Ho Steel Enterprise Corporation, Portugal-based Metalurgica Galaica, S.A. and Spain-based Celsa Atlantic, S.L. and Nervacero, S.A. effective May 4. For all other exporters of subject goods originating in or exported from Belarus, Taiwan, Hong Kong, China, Japan, Portugal and Spain, normal values will be determined by ministerial specification, which are calculated by advancing the export price of the goods by 108.5 percent. In addition, the CBSA stated that nor any exporters/manufacturers in China provided a response to the subsidy requests for information, an amount of subsidy for all exporters of goods originating in or exported from China will be determined by ministerial specification and is equal to RMB 469/mt. The products in question currently fall under Customs Tariff Statistics Position Numbers 7213.10.00.00, 7214.20.00.00, 7215.90.00.90 and 7227.90.00.90. Egypt’s Ministry of Industry and Trade has announced that it has terminated the countervailing duty (CVD) investigation on rebar imports from Turkey and China. The investigation was launched in December 2016 upon the application lodged by the domestic industry alleging that the imports of steel rebar from China and Turkey were imported at subsidized prices causing material injury to the domestic industry. As a result of the investigation, the ministry decided to terminate the anti-subsidy investigation on steel rebar originating in or exported from China and Turkey because there were other causes for the material injury suffered by the domestic industry. The goods in question currently fall under Customs Tariff Statistics Position Number 7213, 7214, 7227 and 7228. The municipal government of Handan in China’s Hebei Province has announced that it plans to eliminate 1.51 million mt of iron-making capacity and 300,000 mt of steelmaking capacity by the end of August this year. Meanwhile, it plans to relocate Handan Iron and Steel Co. (Hansteel), a subsidiary of Hebei Iron and Steel Group (HBIS), from Handan to Ci County, Hebei Province, by the end of June 2019. At the same time, Handan city is also to implement emissions management for 18 steelmakers and 24 coking plants to ensure up-to-standard emissions. At the SteelOrbis 2018 Spring Conference & 78th IREPAS Meeting held in Warsaw on May 6-8, Jens Björkman from Stena Metal International, the chairman of the raw material suppliers committee, stated that since 2015 a rebound has been seen in commodities, as well as scrap, mainly driven by China. He added that most scrap suppliers are worried about the growth in Chinese scrap generation and that the shift in Chinese production to electric arc furnaces might not be quick enough to accommodate the rise in scrap supply. According to Mr. Björkman, there will no long-term exports of Chinese scrap, which will be used in the domestic industry as much as possible. Mr. Björkman indicated that the EU has seen better-than-expected growth, while the US has performed very well with solid domestic market demand amid the Section 232 tariffs. The raw materials committee chairman said that there is still uncertainty in the market on account of protectionism. He said that, as the uncertainty caused by Section 232 is better for the US domestic market, the discussions of the tariff itself boosted domestic demand and steel production in the US even prior to the implementation of the tariff. Accordingly, he expects that the final decision might be delayed until after the June 1 deadline. Regarding the Turkish steel market, Mr. Björkman said that it is characterized by political uncertainty due to the early election, the weaker lira and shorter lead times. The committee chairman concluded that, if there is a global trade war, then everybody will be a loser, adding that he does not believe the intentions are to start a trade war. After the US delayed a decision on Section 232 tariff exemptions to June 1, the Colombian minister of commerce, industry and tourism, Maria Lorena Gutierrez, said all diplomatic channels remain open, despite the uncertainty. Brazil, which was initially excluded from the 25 percent import tariff, had to choose between the tariffs or an import quota, as the US had “unilaterally cut off talks” on April 26. However, a final decision about exempting Colombia “wasn’t announced, so diplomatic and technical channels between the two countries are still open,” said Gutierrez. Colombia sent a request to be excluded from the import tariff on March 13. Colombia is a minor source of US steel imports, with only 44,657 mt of steel shipped to the US in 2017, primarily HDG and OCTG. Colombia’s major steel exporters to the US include Acesco, Corpacero and Ternium­owned Siderurgica de Caldas. According to the Bureau of International Recycling (BIR) press release, BIR was informed of an official CCIC North American Notice that temporarily stops CCIC North America from processing applications and issuing certificates for pre-shipment inspection on scrap materials exported from USA to China. The suspension is for a one-month period ending June 4, 2018, inclusive. The Pre-Shipment Inspection (PSI) system is also temporarily closed. Certificates issued by CCIC North America prior to 3 May 2018 inclusive can still be used for port declaration but will be subjected to 100 percent inspections. While this suspension is for non-ferrous products and does not affect ferrous scrap material, sources close to SteelOrbis warn of the potential disruption in cargo flows, probable premium prices on the same products from other locations, and the ‘serious ramifications’ to the US non-ferrous industry. An export source noted, “Cargoes in transit may fail pre-inspection not on the basis of the opinion of an inspector with metallurgical knowledge but just on someones subjective terms.” The source expects much product to be returned the US. He also added that the lack of export placement by some US entities may “affect their financial position” as many produce and sell both ferrous and non-ferrous materials. According to a report from Reuters, Argentina has agreed to a deal with the US for permanent exclusion from the Section 232 tariffs in exchange for annual import quotas. The country will limit steel exports to the US to 180,000 tons per year. According to US Census Bureau, the US imported 211,465 tons of steel from Argentina in 2017, mostly comprised of OCTG. Argentina’s Production Minister Francisco Cabrera confirmed the news Tuesday. “After intense negotiations we reached an agreement with the government of the United States allowing Argentine aluminum and steel exports to be exempt from tariffs,” Cabrera said in a statement. The Trump administration has indicated it has reached similar deals with Brazil and Australia, although nothing has been announced yet. Negotiations with the EU are continuing, while negotiations with Canada and Mexico are tied to ongoing NAFTA renegotiations. According to news reports late Monday, Donald Trump will delay until June 1 the decision whether to impose steel and aluminum tariffs on countries currently exempted from the Section 232 tariffs. The administration is reportedly finalizing deals with the European Union, Canada and Mexico, while reaching “agreements in principle” with Australia, Argentina and Brazil. The details of those agreements will be finalized in the next 30 days. US Department of Commerce Secretary Wilbur Ross told Bloomberg in an interview over the weekend that the administration would extend the deadline for certain countries, but not all who have applied for waivers from the tariffs. According to a statement from the Turkish Ministry of Economy, Turkey has launched a safeguard investigation on imports of certain steel products to determine if these imports harm or threaten to harm domestic steel producers. Products subject to the investigation include certain flat, long, pipe and hollow sections, railway and tram line components and stainless flat steel products. The product scope of the investigation may change pertaining to information collected during the investigation period. Imports originating from the European Union will be exempt from the investigation. The safeguard investigation will take nine months and the deadline can be extended by six months if deemed necessary. Products subject to the investigation currently fall under Customs Tariff Statistics Position Numbers 7208, 7209, 7210, 7211, 7212, 7225, 7226, 7213, 7214, 7215, 7216, 7217, 7227, 7228, 7302, 7303, 7304, 7305, 7306, 7319 and 7320.